There's been something missing from our Thursday night dinners with our running buddies for some time now and it's certainly not the lack of interesting conversations either. What we've been missing are side tables for our hot tub. That's right, we do actually set our beers down from time to time. 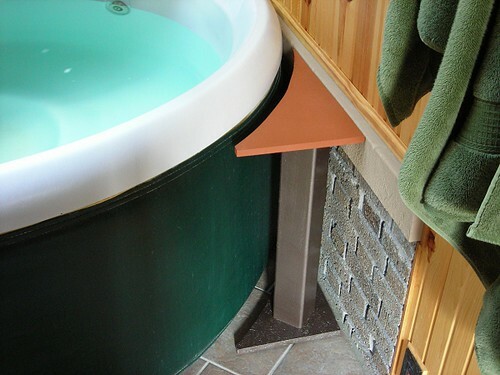 So I came up with these nifty tables designed to follow the contour of the hot tub. The one for the back of the hot tub has a different design because of the plug being back there. They are constructed of plywood, pressed wood, 4x4's and 1" round dowels plus the 3/8" dowels that add the extra support for the back table. I primed the wood at first with a spray paint primer and decided that I really wanted to cover the texture of the wood more so I followed the first primer with a brushed on exterior primer. The tops are finished with a satin spray paint followed by 3 coats of a satin lacquer. The legs and base were primed the same way and finished off with 2 coats of "Hammered" spray paint; it creates on a hammered metal look. I wasn't going to finish the dowels of the back table, but after one use I see that they got a little wet; the back table 4x4 is made out of treated wood so it's fine the way it is. I just uploaded the picture of the third table which fits in the back corner behind the hot tub. I'm adding a picture here, but there is another post about it too. Lance was quite impressed with my creations and my steady hand with a jigsaw.